Eldest son of Charles-Antoine De Mazenod and Marie-Rose Joannis. His mother was of the French middle class, convent educated, and wealthy; his father was an aristocrat, classically educated, and poor. Their marriage, and Eugene's home life, were plagued by constant family in-fighting, and interference from his maternal grandmother and a neurotic maternal aunt. The women never let his father forget that they brought the money to the family. On 13 December 1790, at age eight, Eugene fled with his family to exile in Italy to escape the French Revolution. He spent eleven years in Italy, living in Nice, Turin, Venice, Naples, and Palermo. While he learned Italian and German from dealing with people day to day, the bulk of his education came in Venice from Father Bartolo Zinelli, a local priest. In Palermo he was exposed to a wild and worldly life among rich young Italian nobles. After the Revolution, his mother returned to France, but his father stayed in Italy, ostensibly for political reasons. Upon his own return to France in 1802 in an attempt to reclaim the family lands, Eugene tried to reunite his parents, but failed, and they were divorced, an unusual event in the early 19th century. His often unsupervised youth, the constant fighting at home, and the eventual break up of his family led to his patronage of dysfunctional families and those in them. For years, Eugene struggled in himself, drawn on the one hand to the wordly life he knew from Palermo, and the beauty of the religious life he had seen in Venice with Don Bartolo. In an effort to work it out, Eugene began teaching catechism and working with prisoners in 1805. God won at last, assisted by a mystical experience at the foot of a cross on Good Friday 1807 when Eugene was momentarily touched by the full force of the love of God. He entered the seminary of Saint Sulpice, Paris in 1808. Ordained on 21 December 1811 at age 29 at Amiens, France. Because of his noble birth, he was immediately offered the position of Vicar General to the bishop of Amiens. Eugene renounced his family's wealth, and preferred to become a parish priest in Aix-en-Provence, working among the poor, preaching missions and bringing them the church in their native Provencal dialect, not the French used by the upper classes. He worked among the sick, prisoners, the poor, and the overlooked young. Eugune contracted, and nearly died from, typhus while working in prisons. Eugene gathered other workers around him, both clergy and laymen. They worked from a former Carmelite convent, and the priests among them formed the Missionaries of Provence who conducted parish missions throughout the region. They were successful, and their reputation spread, bringing requests for them outside the region. Eugene realized the need for formal organization, and on 17 February 1826 he received approval from Pope Leo XII to found a new congregation, the Oblates of Mary Immaculate founded on his core of missionaries. Though he would have preferred to remain a missionary, Eugene knew that position with the Church hierarchy would allow him to insure the success of his little congregation. He was appointed Vicar-General of Marseille in 1823. Titular bishop of Icosia on 14 October 1832. Co-adjutor in 1834. Bishop of Marseilles, France on 24 December 1837, ordained by Pope Gregory XVI. He founded 23 parishes, built or retored 50 churches, cared for aged and persecuted priests, restored ecclesiastical discipline, and developed catechetics for young people. Started work on the cathedral and shrine of Notre-Dame de la Garde in Marseille. Welcomed 33 congregations of religious brothers and sisters into the diocese. More than doubled the number of priests in his diocese, and celebrated all ordinations himself. Eugene realigned parishes and maneuvered behind the scenes to weaken the government monopoly on education. He was an outspoken supporter of the papacy, and fought government intervention into Church matters. Publicly endorsed the dogma of the Immaculate Conception, and worked for its promulgation. His printed writings run to 25 volumes. Made a peer of the French Empire. Archbishop of Marseille in 1851 by Pope Blessed Pius IX. Helped Saint Emily de Vialar re-build the Sisters of Saint Joseph of the Apparition after their move to Marseille. Named senator and member of the Legion of Honour by Napoleon III in 1856. Proposed as cardinal in 1859. On 2 December 1841, Bishop de Mazenod's first overseas missionaries arrived in Canada. By the time of his death in 1861, there were six Oblate bishops and over 400 missionaries working in ten countries. The Oblates continue their good work to this day with some 5,000 missionaries in 68 countries. Born to Rosalia Huber and Franz Bachmeier, servants too poor to get married. His father died in World War I when the boy was less than ten years old; his mother then married local famer Heinrich Jägerstätter who adopted Franz. Franz had little formal education, but his adoptive father was serious about the boy being able to read so that he could educate himself. At age 20 he began three years of work in the iron ore industry. He led a rather wild and dissolute life in his early 20's, but by his late 20's had settled down to life as a peasant farmer, became serious about his faith, married, and became the father of three daughters. He worked as sacristan for his parish, arranging funeral and prayer services, attended Mass daily, and developed a special ministry to the bereaved. He became known as a vocal critic of the Nazis; he was the only one in his village to vote against Austrian unification with Germany in 1938, when greeted with "Heil Hitler" would respond "Pfui Hitler", and basically had no social life in the town because of his beliefs. When drafted into the army of the Third Reich, Franz could not reconcile such service with his faith; after a brief period served behind the lines, he refused to report for further service, was arrested, imprisoned in Linz, Austria, and Berlin, Germay, given a military trial, and finally executed. He spent time in prison praying, supporting other prisoners, and writing a series of letters and essays. The 1917 Mexican constitution was pointedly anti-clerical and anti-Church, and its adoption instituted years of violent religious persecution including expulsion of foreign priests, closing of parochial schools, and the murders of several priests and lay leaders who work to minister to the faithful and support religious freedom. 25 of them who died at different times and places but all as a result of this persecution were celebrated together. They each have separate memorials, but are also remembered as a group. Oldest of three children born to a freedman Anglo-Saxon farmer. An adventurous seafaring man, Godric spent his youth in travel, both on land and sea, as a peddler and merchant mariner first along the coast of the British Isles, then throughout Europe. Sometime sailor, sometime ship's captain, he lived a seafarer's life of the day, and it was hardly a religious one. He was known to drink, fight, chase women, con customers, and in a contemporary manuscript, was referred to as a "pirate". Converted upon visiting Lindisfarne during a voyage, and being touched by the life of Saint Cuthbert of Lindisfarne. Pilgrim to Jerusalem and the holy lands, Saintiago de Compostela, the shrine of Saint Gaul in Provence, and to Rome, Italy. As a self-imposed austerity, and a way to always remember Christ's lowering himself to become human, Godric never wore shoes, regardless of the season. He lived as a hermit in the holy lands, and worked in a hospital near Jerusalem. Hermit for nearly sixty years at Finchale, County Durham, England, first in a cave, then later in a more formal hermitage; he was led to its site by a vision of Saint Cuthbert. It was a rough life, living barefoot in a mud and wattle hut, wearing a hair shirt under a metal breastplate, standing in icy waters to control his lust, living for a while off berries and roots, and being badly beaten by Scottish raiders who strangely thought he had a hidden treasure. Noted for his close familiarity with wild animals, his supernatural visions, his gift of prophecy, and ability to know of events occurring hundreds or thousands of miles away. Counseled Saint Aelred, Saint Robert of Newminster, Saint Thomas Beckett, and Pope Alexander III. Wrote poetry in Medieval English. The brief song Sainte nicholaes by Godric is one of the oldest in the English language, and is believed to be the earliest surviving example of lyric poetry. He was said to have received his songs, lyrics and music, complete during his miraculous visions. Born to a family of wealthy merchants, the son of François-Bernard Cormier and Marguerite-Felicité Bracquemond, he was baptized at the age of one day with the name Louis-Stanislas-Henri Cormier, but his family always called him Henri. His father died when Louis was a small boy, his brother soon after, and his uncle, a parish priest, helped raise him. Studied at home, then with the Christian Brothers, and entered the minor seminary in the diocese of Orléans, France at age 13. Could play the flageolet (a woodwind similar to a recorder), organ and ophicleide (a brass, trumpet-like instrument), and was known as a fine singer; Franz Liszt is reported to have admired Louis’ skills at the organ. Henry became a Dominican tertiary while in seminary, graduated at the top of his class, and was ordained on 17 May 1856, having obtained a special dispensation as he was technically too young. Received the Dominican habit on 29 June 1856, taking the name Hyacinthe-Marie. Afflicted with a recurring hemorrhaging problem, he continued his studies and was allowed to make his profession on 23 May 1859 though everyone assumed it was on his death-bed. However, he survived, soon after made a complete recovery, and became active in his Order and his house. Noted confessor and teacher, he is known to have written 171 texts in his life. Master of novices. Prior of the convent of Corbara in Corsica, France in 1863. Prior-Provincial of Toulouse, France from 1865 to 1874. Prior of the Dominican community in Marseilles, France. Served as Prior-Provincial again from 1878 to 1888. 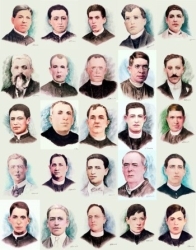 Definitor of the Dominican General Chapter of Lyons, France in 1891. Procurator of the Dominicans, working in Rome, Italy. In 1899 Pope Leo XIII considered elevating Father Hyacinthe-Marie to cardinal, but held off due to the political problems with France that would ensure over the appointment. Served as the 76th Master of the Dominicans from 21 May 1904 until 1916. He restored many of the suppressed Dominican provinces, and helped the Order expand into western United States. Founded the Dominican Sisters of Saint Catherine of Siena of Auch. Noted and powerful preacher. Worked for the beatifications of Blessed Reginald of Orléans, Blessed Bertrand Garrigue, Blessed Raymond of Capua, and Blessed Andrew Abellon. Helped re-organize what became the Pontifical University of Saint Thomas Aquinas in Rome. He finally retired to live his remaining days as a prayerful monk at the priory of the Basilica of San Clemente in Rome. We have two stories about this martyr, one medieval with limited information, the second later in composition, and much more colourful. 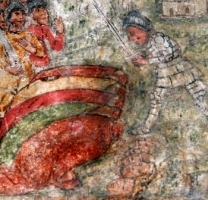 The oldest sources say that Restituta fled persecution in north Africa with five male companions (possibly the Martyrs of Noli). She evangelized the Balagne region of Corsica, and was martyred by Roman authorities during one of the imperial persecutions (dates vary). The later documents say that she was born to a pagan family with ties to the imperial Roman army, converted to Christianity as a girl and was soon denounced to anti–Christian local authorities. She was beaten and stoned to get her to renounce Christianity. When she refused, she was thrown into a fire, but would not burn. She was then beaten with iron combs, but her wounds bled milk. These miracles converted several of the soldiers who were guarding and torturing her. She was then taken out to sea and thrown in to drown, but a chunk of cork floated her back to shore while the pagans on the boat were drowned. Her tormentors finally gave up on these slow, torturous methods of murder, and beheaded her with several other stubborn Christians. These martyrs then picked up the severed heads and walked to the place where the first chapel of Saint Restituta was built. Monk in Wales, Brittany and Cornwall. Believed to have travelled to Rome, Italy. Lived as a hermit in a small cave near Glastonbury Abbey. Abbot of a monastery in Wales. The Welsh town of Llangollen (Collen's enclosure), Clwd is named for him, indicating that it formed around his hermitage and church. Collen was at the right time and place to be a transitional figure in the folklore of the region. There are tales of him slaying a Welsh giantess to save the people of Llangollen (the church there still has an image of him in this triumph), and of fighting a duel with a Saracen in front of the Pope. Stories have him being taken to the land of faerie, but always as a Christian, and always showing the power of God over the old ways. Legend says that Collen was once invited to dine with the King of the Fairies; some say he was asked by a man, some say by a fairy, and some say by a talking peacock; I cannot say. The saint declined three times, but finally accepted. Though the king appeared to live in an enormous castle, wealthy and fair, surrounded by courtiers and servants, and seated before a table groaning under the weight of good eatings. Collen, however, knew him for the lying spirit he was. The saint reminded the king of the fate of the Godless, then sprinkled holy water in all directions; in an instant there was nothing left but an angry, demonic bird, flying away from the scene. Another version has it that Collen, while he lived as a hermit near Glastonbury, was summoned to settle the eternal May Day struggle of Gwynn ap Nudd, Lord of the Underworld, with Gwyther, Lord of Summer, for the hand of the fair Creiddylad, the Maiden of Spring. Collen ordained that the quarrel would be resolved on Doomsday, and not before. Then with a sprinkle of holy water, the faerie folk and fortress disappeared. Born to the Italian nobility, the son of Giovanni, a senator and judge; his mother‘s name was Odolina. We know he had brothers, and was married at one point, but nothing else survives of his early life. Served in the court of Pope Innocent III. Chosen rector and papal governor of Orvieto, Italy in 1199, a turbulent area used as a base by Patarine Cathar heretics, and in the middle of endless struggles and machinations of the Guelphs and Ghibellines, between supporters of the Pope and those of the Emperor of Germany; Pietro was given a mission to bring peace and suppress heresy which meant he was welcomed with open arms by orthodox Catholics, with open opposition by the supporters of the various heresies and factions. Kidnapped by a gang of Patarine heretics, he was beaten and offered freedom if he would retract all anti–heresy laws in the area, and agree to never trouble the Patarines and Carthars again; he declined. Martyr. The backlash against his killers led to a popular uprising, suppression and exile of the heretics. Hermit at a place now named Cap-Saint-Hospice in his honour, living in the ruins of an old tower, wearing heavy iron chains, living off bread and dates and not even that during Lent. Foretold the invasion of Gaul by the Lombards. A Lombard patrol c.575, finding Hospitius loaded with chains and living in isolation, decided he was some type of criminal; Hospitius agreed that he was a terrible sinner, with a litany of offenses to his shame. Convinced he was a danger of some sort, one of the soldiers raised his sword to kill the old hermit; the soldier's sword arm became paralyzed, moving again only after Hospitius made the sign of the cross over it. The soldier was converted on the spot, and spent the rest of his life in service to God. Hospitius foretold the hour of his own death, spent his last hours in prayer, took off his chains, and passed on. Studied in Uppsala, Sweden and Paris, France; one of his classmates in Paris became Pope Clement VI. Priest. Canon of the cathedral of Åbo, Turku (in modern Finland) in 1329. Evangelizing bishop of Åbo in 1338 where he served for 28 years. He renewed the faith of his flock, improved the education, training and discipline of his priests, improved liturgical furnishings and diocesan finances, and worked for peace among the peoples of his area. Friend of Saint Bridget of Sweden. Ordained in 1902 in the archdiocese of Braga, Portugal. Transferred to the diocese of Frederico Westphalen, Brazil in 1913. Known as a concerned pastor to his flock, and for his social work in the region. Martyred with his altar boy, Blessed Adilo Daronche. Member of the Brothers of the Christian Schools, entering the novitiate on 14 January 1744. Imprisoned on a ship in the harbor of Rochefort, France and left to die during the anti–Catholic persecutions of the French Revolution. One of the Martyrs of the Hulks of Rochefort. Led the church founded by Saint Columba in Drum Cullen, Offaly, Ireland in the 6th century. Later lived in Killbarron near Ballyshannon, Donegal, Ireland. Legend says that the sailed to America even before Saint Brendan the Navigator. Young lay person in the diocese of Frederico Westphalen, Brazil. Martyr. Born to the Irish nobility. Priest. Benedictine monk. Abbot. Bishop. Having encountered opposition from a local lord, Silao went to Rome, Italy to appeal for support from Pope Gregory VII, but died on the road on the return trip. Fifth-century bishop of Vannes in Brittany (in modern France). Late in life he retired from his see to spend his final years as a hermit. Early desert monk whose unflinching dedication to the ascetic life was an example to many others at the beginning of the monastic movement. Pilgrim to Rome, Italy. Benedictine monk. Martyred defending the altar at the monastery of Blèze, Côte-d'Or, France against Norman invaders. Sister of Charlemagne. Nun at Aire in the Artois region of France. Priest. Martyred along with a group of unnamed clergy in the persecutions of Constantius for opposing the Arian heresy. Mercedarian priest. Confessor of King James II of Castille, and the Infanta Isabella. Benedictine monk. Martyred defending the altar at the monastery Blèze, Côte-d'Or, France against Norman invaders. Priest. Martyred defending the altar at the monastery at Blèze, Côte-d'Or, France against Norman invaders. Benedictine monk. Killed defending the altar at the Blèze Abbey, Côte-d'Or, France against Norman invaders. Soldier. Tribune in the imperial Roman army. Martyred with other soldiers. Young boy. Martyred at the monastery of Blèze, Côte-d'Or, France against Norman invaders. Archbishop of Vienne, France from 970 to 1001. Deacon in Mauretania Caesariensis in North Africa. Martyred in the persecutions of Diocletian. Bishop. Martyred with three boys whose names have not come down to us. Sixth century bishop of évora, Portugal. Martyr. Fourth century priest in France. Large number of bishops, priests, deacons and lay people banished when the Arian heretics seized the diocese of Alexandria, Egypt in 357 and drove out Saint Athanasius and other orthodox Christians. Many were old, many infirm, and many, many died of abuse and privations while on the road and in the wilderness. Very few survived to return to their homes in 361 when Julian the Apostate recalled all Christians; and then many of those later died in the persecutions of Julian. 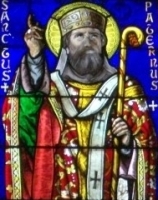 An unspecified number of Christian clerics and lay people who, on Pentecost in 338, were rounded up by order of the Arian bishop and emperor Constantius, and were either killed or exiled for refusing to accept Arian teachings.